PMR’ recent market study titled “Circadian rhythm sleep treatment Market: Global Industry Analysis 2013–2017 and Forecast 2018–2028” comprises a comprehensive assessment of the key market dynamics. On conducting a thorough research on the historic as well as current growth parameters of the circadian rhythm sleep treatment market, growth prospects of the circadian rhythm sleep treatment market have been obtained with maximum precision. The report features unique and salient factors that are likely to have a significant impact on the development of the circadian rhythm sleep treatment market during the forecast period. These factors can help market players modify their manufacturing and marketing strategies to envisage maximum growth in the circadian rhythm sleep treatment market in the coming years. The report provides detailed information about the current and future growth prospects of the circadian rhythm sleep treatment market in the most comprehensive way for the better understanding of readers. The circadian rhythm sleep treatment market is primarily dominated by a few leading manufactures of sleep disorder treatment devices and drugs. The availability of advanced technologies associated with circadian rhythm sleep treatment devices ensures lucrative business opportunities for market players. Key players such as The Sunbox Company, Verilux, Inc., Carex Health, Northern Light Technologies, Koninklijke Philips N.V., Amjo Corp, Lucimed SA, and Koninklijke Philips N.V. account for a remarkable revenue share of more than half of the global circadian rhythm sleep treatment market. Furthermore, increasing product research in therapy devices and adoption of drugs for circadian rhythm sleep treatment are the factors estimated to boost the circadian rhythm sleep treatment market. The global revenue of circadian rhythm sleep treatment market is expected to cross US$ 941.5 Mn in terms by the end of 2028. Significant growth potential has been estimated for circadian rhythm sleep treatment market at a CAGR of 4.7%, during 2018-2028. It is estimated that around 50-70 million American adults suffer from one or more sleep disorders. Amongst them, circadian rhythm sleep disorder is a very common and one of the most neglected sleep disorders. The disorder mainly occurs when a person's biological clock fails to synchronize to a 24-hour day. Delayed sleep phase disorder affects around 7% of urban adolescents. Delayed Sleep Phase Syndrome (DSPS) a prevalent type of circadian rhythm sleep disorder which is very common in adolescents and young adults with an estimated prevalence of 0.17% in the general population and 7–16% among adolescents. It has been estimated that around 5-10% of patients with chronic insomnia in sleep clinics have delayed sleep phase disorder. According to research, blind people are affected more by the disorder than those with sight. Around 55-70% of all people who are totally blind have circadian rhythm sleep disorder. Thus, the increasing prevalence of circadian rhythm sleep disorder will fuel the adoption of circadian rhythm sleep treatment and would further drive the growth of the global circadian rhythm sleep treatment market. Sleep problems are generally associated with accidents and human errors. By 2020, the number of people killed in motor vehicle crashes is anticipated to double to 2.3 million globally, of which around 230,000–345,000 will be as a result of fatigue or sleepiness. Similarly, disturbed sleep is expected to double the risk of a fatal accident at work over a 20-year period. Around 1.2 million car collisions are caused by drowsy driving each year. According to a 2011 report, a total of 3970 fatal accidents took place in France, 85% of which were related to sleep-deprived driving. In order to reduce accidents, proper sleep is a must. Thus, increasing risk of fatal accidents due to disturbed sleep increases the treatment rate and drives the growth of the global circadian rhythm sleep treatment market. In recent years, several researchers have been studying sleep disorders and how circadian disturbances affect human health. The National Heart, Lung, and Blood Institute funds research to discover better ways to achieve and promote sleep health, increase community awareness, and inform public policy for the enhancement of healthcare for humans. 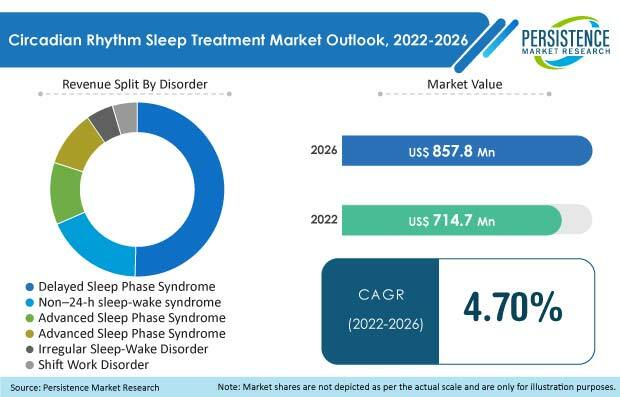 The competition section of the circadian rhythm sleep treatment market features the profiles of the key players operating in the market based on their shares, differential strategies, product offerings, marketing approach, and company dashboard. Some of the key players operating in the circadian rhythm sleep treatment market include Vanda Pharmaceuticals, Takeda Pharmaceutical Company, Teva Pharmaceutical Industries Ltd., Mylan N.V. in drugs treatment and include The Sunbox Company, Verilux, Inc., Carex Health, Northern Light Technologies, Koninklijke Philips N.V., Amjo Corp, and Lucimed SA in therapy devices. The circadian rhythm sleep treatment market involves treatment drugs and therapy devices. The primary event in circadian rhythm sleep treatment is depression of melatonin level and irregular melatonin level during the circadian body clock. The drug treatment for circadian rhythm sleep disorder covers hypnotic drugs and melatonin agonist drugs. Additionally melatonin hormone in pure form is prescribed in drug therapy. The therapy device involves the use of high-intensity bright light to alter the activity of receptor in the eye to adjust the melatonin level and circadian rhythm of the body. PMR has conducted a research study on the circadian rhythm sleep treatment market for the forecast period 2018 to 2028. The circadian rhythm sleep treatment market report offers a comprehensive evaluation of the business opportunities available in the circadian rhythm sleep treatment market, along with insights on the consumption of circadian rhythm sleep treatment, incidence of diseases, awareness about critical limb ischemia, and the competitive landscape of the circadian rhythm sleep treatment market. The report elaborates on the macro-economic factors influencing the dynamics of the circadian rhythm sleep treatment market and its futuristic potential. The report offers a comprehensive taxonomy of the circadian rhythm sleep treatment market based on the treatment type, disorder, distribution channels, and region. Different circadian rhythm sleep treatments in the market include therapeutic devices, drugs, and Chronotherapy. These circadian rhythm sleep treatments are utilised for disorders such as Delayed Sleep Phase Syndrome (DSPS), Advanced Sleep Phase Syndrome (ASPS), Non–24-h Sleep-Wake Syndrome (Non 24), Irregular Sleep-Wake Disorder (ISWD), Shift Work Disorder, and Jet Lag. Circadian rhythm sleep treatment devices, drugs, and Chronotherapy are distributed by distribution channels such as institutional sales and retail sales. The circadian rhythm sleep treatment market has been analysed across the regions of North America, Latin America, Europe, East Asia, South Asia, Oceania, and MEA. What is the revenue potential of circadian rhythm sleep treatment across the regions of North America and Europe? Who are the key competitors and what are their portfolios in circadian rhythm sleep treatment market? What are major challenges influencing the growth of the circadian rhythm sleep treatment market? How is intervention from regulatory authorities impacting the growth of the circadian rhythm sleep treatment market? The circadian rhythm sleep treatment market has been estimated based on the consumption and supply-demand approach. The market was first calculated based on the consumption of circadian rhythm sleep treatment in different regions/countries. The volume growth of circadian rhythm sleep treatment was estimated based on the consumption of various types of circadian rhythm sleep treatment in the top 20 countries globally across five disease indications. Other qualitative factors analysed during the volume estimation of circadian rhythm sleep treatment include the level of awareness regarding circadian rhythm sleep disorders and others. This information is further validated with rigorous primary research (which includes interviews, surveys, in-person interactions, and the viewpoints of seasoned analysts) and secondary research (including verified paid sources, authentic trade journals, and resourceful databases). The research study on the circadian rhythm sleep treatment market also includes the top trends and macro- as well as micro-economic factors shaping the circadian rhythm sleep treatment market. With this approach, the report on the circadian rhythm sleep treatment market estimates the industry attractiveness of every major segment of the circadian rhythm sleep treatment market over the forecast period.